A father and son initiation is one of those very special occasions in Freemasonry that leave a lasting impression on all those involved and all those who witness it alike. Chris Furmston, secretary of Sincerity Lodge No 3677, who meet at Ashton in Makerfield Masonic hall, was delighted to learn that his son Gareth had decided to follow in his footsteps and join this wonderful institution. 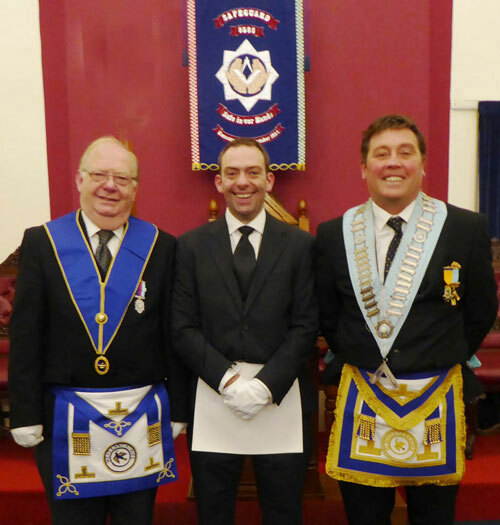 Pictured, from left to right, are: Chris Furmston, Gareth Furmston and Mark Ashlee, WM of Safeguard Lodge. The only problem was that Gareth no longer lived in the West Lancashire area, and was to be initiated into the Safeguard Lodge No 9566 in Chipping Sodbury, South Gloucestershire. You can imagine Chris’s delight, when following discussions with the lodge, he was invited by Mark Ashlee, WM of Safeguard Lodge, not only to attend, but to actually perform the initiation ceremony. This news, of course, generated a great deal of interest and excitement amongst the members of Sincerity Lodge and in turn amongst other West Lancashire Masons. All, together with Gareth’s two uncles from North Wales and Masons from as far afield as Somerset, Hampshire and Isle of Wight and Bristol Provinces, witnessed a fine and heart-warming ceremony as Chris initiated his son Gareth. There is little doubt that this will be the start of further trips, both north and south, in the true spirit of Masonry universal. Gareth Furmston and Mark Ashlee (centre) surrounded by West Lancashire Masons.